MusicMakers003: Jeffrey Lewis « Adafruit Industries – Makers, hackers, artists, designers and engineers! MusicMakers is a new interview series from Adafruit that explores the intersection of the DIY music and maker communities. We’ll be talking to some of our favorite musicians about art, tech, DIY, gear tips and more. Along the way, we hope you’ll find some great new music as well as some ideas and inspiration for your own projects. This week, we’re lucky enough to feature acclaimed musician and comic book artist Jeffrey Lewis. Since coming to prominence in 2001 with his The Last Time I Did Acid I Went Insane and other favorites LP on Rough Trade Records, Lewis’ music has evolved sonically and stylistically from lo-fi acoustics and ramshackle folk-punk recordings to working with bigger lineups and larger arrangements. Over the years, he has experimented with “communist songwriting” as part of the Guitar Situations collective and has collaborated with the likes of Kimya Dawson, Diane Cluck and Peter Stampfel. The shift from earlier recordings like “Seattle” and “Don’t Let the Record Label Take You Out to Lunch” to more expansive material such as “Mini​-​Theme: Moocher From the Future,” “The Upside-Down Cross” and “Back to Manhattan” is pretty staggering. But for me, the inspiring thing is not the idea that with time you can work your way to more expensive studios, better equipment or bigger collaborations but the notion that you can learn to make beautiful music at home with your brother on acoustic guitars, just as you can make beautiful music in a great studio with a killer band on the best equipment. Lewis is a songwriter and a creator, one who has toured the world and made powerful original records like ‘Em Are I and City & Eastern Songs. But he first found acclaim with an acoustic guitar through tape hiss. And even before the Rough Trade record deal, he was making unique music on a DIY level (check out the Songs from Austin ‘00-’01 and Tapes from the Crypt ‘97-’01). If you can’t take inspiration from that, then maybe you can take heart from the fact that someone best known for his way with words was able to create a gorgeous album of anarcho-punk covers on 2007’s 12 Crass Songs. 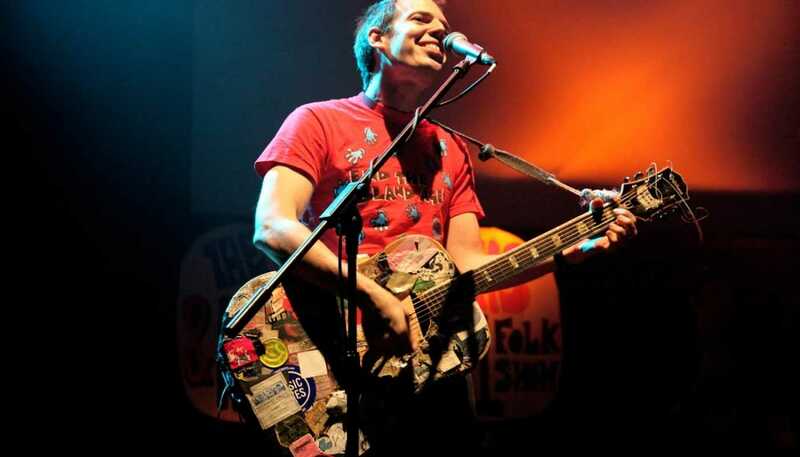 In my opinion, the message to take from Jeffrey Lewis is that you can do something special with practically anything. Lewis is someone who has been working professionally as a musician and creator for over a decade, utilising a number of lineups, styles and recording methods. He has a unique perspective and is a great person to talk to to about making and recording music. Listening to the radio as a kid, my parents would have it on I guess. I didn’t like the Beatles songs or Jimi Hendrix songs but I loved Michael Jackson and I loved the rap stuff anytime I heard any, Whodini especially. Writing a new issue of my comic book series, mastering an album I recorded of covers of Tuli Kupferberg songs, mixing an album I recorded in collaboration with Peter Stampfel, and working on writing and recording new songs with my band for my own next album. Remastering and repackaging my old 2005 album “City & Eastern Songs” for a deluxe vinyl re-issue. Also I’ve been working on booking a USA east coast tour for January. The most positive effect of changing technology was that everybody dumped their 60s LPs real cheap in the 1990s, so as a teenager who was becoming obsessed with music and specifically obsessed with 1960s classic rock, it was a gold mine. It was at just the right time for me. When I was 15, 16, 17, and I had almost zero money, I could still very cheaply get my hands on almost any LP imaginable by the Rolling Stones, Dylan, Pink Floyd, Zeppelin, Grateful Dead, Jefferson Airplane, Cream, CCR, Traffic, Donovan and slightly deeper layers of 1960s music like the Incredible String Band, Love, the Fugs, David Peel, Moby Grape, Ultimate Spinach, Pearls Before Swine, The Great Society, HP Lovecraft, Phil Ochs, all this stuff was findable for a few bucks, basically. I built up a colossal music trove of absolutely incredible 1960s LPs, for prices that were just perfect for a broke teenager. And then by the time I was hunting for truly impossible obscure LPs, which were way out of my meager price range, all that deeper-deeper-obscure stuff started to get reissued and/or findable online in the 2000s. So for an addict of the magic of out-of-print records, the sequence of events that made LPs get dumped on the market cheap in the 1990s and brought back digital reissues of the impossible-to-find LPs in the 2000s, all of that was really a dream come true for me. I don’t have a home recording set-up, other than just to record simple solo acoustic songs as I write them, onto my little digital Tascam recording device, or onto Garageband on my laptop. It’s the modern equivalent of having a recording walkman handy, to quickly tape a freshly-written song before you forget it existed. Unfortunately Garageband has truly horrible sound. The sound warbles and compresses in a way that makes my quickie Garageband recordings sound much worse than my old quickie walkman home tape-recordings. The older versions of Garageband sounded a lot better. It’s just the free built-in program that comes with my laptop. For making a “real” album, with my band and drums and all that, I’ve been going to the studio of my friend Brian Speaker for the past few years, originally in Williamsburg Brooklyn, then priced out to Bushwick, and currently in Ridgewood Queens till it gets priced out even further. It’s a nice recording studio, proper control room, modern giant mixing desk, all the usual gear you would expect in a modern full recording facility. My method has often been to record a full album in 2 days if I can. If the band knows how to play the songs, there’s no reason why you can’t get an album done in two days. We record live, all together in the live room, one or two takes of each song. Maybe we’ll re-do the vocals separately that evening if it’s needed. Not very many overdubs, but they can be done easily if I hear something I want to re-do or add. Brian will do a basic mix, for the drums and bass and guitar and vocals, and whatever else; it’s not trying to re-invent the wheel, it’s just a standard mix that’s perfectly listenable. Get the songs all to sit together at a comparable volume, and bang, you walk out with a finished album ready to send out for duplication. I have a pretty firm belief that if you have great songs, you have a great album. Yes, I do make some albums that take a lot more work, and thinking, and money, and arranging and mixing and all of that. But still, the most important work is the writing, that you can do at home, for free, off the clock, just with a pen and paper or a laptop. That’s where 90% of the quality of your album is going to come from, and it’s free. I’m not a gear-head, I’ve been using the same beat-up guitar for a couple decades. I was making my living as a professional musician for years before I ever owned one single amplifier. Now I own a couple of them, just small cheap ones that are easy to carry. Portability, that’s the main gear-goal for me. I use the smallest possible guitar pedals, those Mooer ones, that are a fraction of the size of “normal” pedals. I don’t know if they sound any better or worse than other pedals, but they sure are easier to carry. I use Casio SK-1 keyboards in my band because they are the most light-weight keyboard I’ve ever found that still has all the sounds I need and enough octaves to play most parts I need. I’m sure there are better amps, better guitars, better keyboards, and better pedals in the world. But when you’re running through an airport to catch a flight, or when you’re playing a rock club that’s at the top of three flights of stairs, you’ll learn the wisdom of your gear-choices pretty fast. If you own an amp that you can’t actually take on tour or carry to a recording studio because it’s too heavy or too delicate or too valuable then you don’t own an amp. Go buy an amp. One you can use. “They Can’t Hurt Me” by The Lyrics. Everything I needed to know about rock & roll I learned from Pebbles and Back From the Grave compilations; this stuff taught me that rock & roll is different from classic rock and punk rock and hard rock, etc. I love those other genres too, but they’re not the same as rock & roll. Rock & roll is truly great, and it does exist but it’s not heard very often, weirdly, other than the first few Rolling Stones albums, and certain 60s garage comps. It’s not 50s rock like Jerry Lee Lewis, it’s not 70s rock like Motorhead, it is 60s rock, but it’s 60s rock that is not “classic rock;” I mean Santana and the Grateful Dead are awesome, but they don’t play rock & roll. “Just In Case You’re Wondering” by the Ugly Ducklings, that’s another song that’s a must. I owned everything Led Zeppelin ever recorded but I never knew what rock & roll was until I heard a track like that. When I got the Pebbles Volume 7 LP, my music changed overnight. The average person will walk around taking for granted that they have heard rock & roll, but it’s entirely possible that they haven’t. The Manhattan LP is out now on Rough Trade Records. You can keep up with Jeffrey Lewis on Facebook, Bandcamp and his website. Jeffrey Lewis is touring across the United States in January 2018 and in the UK in March and April. You can see if he’s coming to your town here.